Love it!. I was worried when I rolled it out that there wasn't enough detail but once it was on the wall, it was perfect. It is exactly what I needed for my new relaxation room. I am 5' 3" and was able to do it by myself. Do be careful not to let the sticky edges fold over and touch. They are a pain to pull apart. I like it.i could only use 4 panels because my wall was 70 inches but it still turned out good. Exactly as advertised!!! I looks amazing on my wall. Instructions were accurate. Thank you for the .5 inch overlap. It made the install soooo much easier. We were happy with our mural. I looks nice, and wasn't too hard to install. Definitely a two person job though! Fantastic image. Take your time with peeling the backing off, it can be a little tricky. It can be done with one person but I would recommend two. With two people we were able to get this installed in half an hour. Wow! What an amazing mural - it looks so realistic! 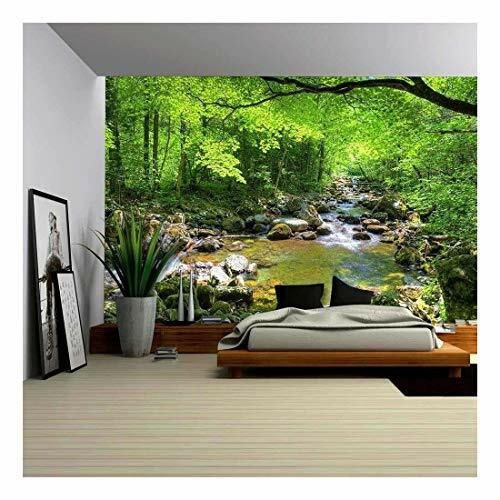 Absolutely beautiful and just what I wanted for my son’s room - he wanted a woodland theme, and this fit perfectly! It is a bit tricky to hang it and get it to line up properly since it comes in 6 sheets - make sure you have a helper and a step ladder! I put this mural up in my classroom this past August 2017. Everyone that walks by loves it! I always have students that want to sit in the corner I put it in. I did follow the directions to a T by cleaning the wall first with Clorox wipes. I've had no problems with unsticking on the painted cinder block wall its on. For added strength, though, I also put command strips underneath at the very top. The curtain shown in one of the pics can also be found on amazon.